Supporting therapists to start important conversations with young or vulnerable people. As a gallery space Iniva (Institute of International Visual Arts) has hosted and produced major solo exhibitions by significant British and international artists. A spin-off of their education programme resulted in Iniva Creative Learning, a platform for jointly delivering art therapy services for schools, therapists and community groups worldwide. 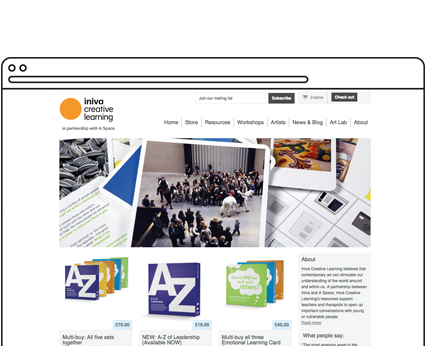 Iniva Creative Learning approached us requiring a new easy-to-use ecommerce platform to promote and sell their resources online. Iniva Creative Learning produce resources for art therapy, most notably their ‘Emotional Learning Cards’, which feature images of contemporary art together with questions and suggestions for activity and discussion, written by experienced therapists. They are both a great introduction to contemporary art, and a fantastic way to open up a dialogue with young people. We used Shopify to develop a robust and easy-to-use ecommerce platform for Iniva. The website integrates with Sagepay to handle all of the online payment process securely, and works out international shipping costs automatically. Shopify makes it incredibly easy for Iniva to manage their product listings and process orders through the admin dashboard, and provides a seamless user shopping experience. Since launching, they have processed thousands of orders through the website.